It begins on Day 2 of a worldwide epidemic, with patient zero, Beth Emhoff (Gwyneth Paltrow), returning home from a trip to Hong Kong. After briefly reuniting with her family, she has a sudden seizure, is rushed to the hospital, and dies shortly thereafter. In these first days, she is one of a few perishing in identical, equally rapid ways. Those numbers begin to grow at a startling rate, and it is immediately apparent this is a new, previously unseen contagion, one humanity is not ready to deal with. There is no treatment, no cure, and no vaccine. The American Center for Disease Control (CDC) races to research the disease and find treatment, but it’s spreading faster than they can handle it, and things only get worse once the full scope of the threat is made public and society begins descending into chaos. The story is fairly typical; we’ve seen movies about mass outbreak before, and like “Contagion,” most are designed to scare the audience with this horrific ‘what if?’ scenario. What separates “Contagion,” then, is how it approaches the story in such a down-to-earth, realistic manner. There are a number of characters and stories at play, each of which tackle a microscopic element of the crisis in order to paint a macroscopic portrait of the worldwide catastrophe. Laurence Fishburn, Kate Winslet, Elliot Gould, Bryan Cranston and others appear as doctors, government officials, and members of the CDC researching the virus, trying to find a cure and doing their best to keep society calm and in check while they do so. Matt Damon’s character, husband to patient zero, represents the everyman in that society as he struggles to keep himself and his teenage daughter alive in a world going to hell. Jude Law’s sensationalist blogger character, meanwhile, sparks a discussion of the role media would play during the crisis, while another doctor investigating the pandemic, played by Marion Cotillard, is embroiled in a case of humanitarian ethics in China. There are more sub-plots than the ones I’ve mentioned, and each of the major stories branches off into other paths, all of these trails interconnecting in one way or another over the course of the film. Some of the stories work better than others – despite some fine work from the actress, Cotillard’s plot is too tangential and underdeveloped to truly feel of a piece with the overall narrative – but on the whole, every aspect of the film is fascinating, and each component is expertly chosen and realized to illustrate the full scope of the crisis. The nature of this structure demands a brisk pace and leaves little room for characterization, meaning that the actors have to do a lion’s share of the heavy lifting. Each performance must arrive fully formed – the film has no time for traditional introductions – and the emotional or mental toll the epidemic places on the characters is never spelled out in the writing, but left to the cast. Each actor in the vast ensemble rises to the occasion, and while singling out all of the many fantastic performances would be folly – because the cast is massive and they all uniformly demonstrate the subtle, expressive traits I highlighted above – I must emphasize Matt Damon’s work as particularly impressive. Damon, a brilliant actor who never quite gets the credit he deserves, showcases tremendous vulnerability, and though his dialogue is relatively limited, he speaks volumes about the toll the situation puts on his character with his expressions and body language. This is one of the year’s best performances, certainly worthy of consideration come Oscar time. The strength of the cast is no surprise with Soderbergh in the director’s chair. As he proved with the “Ocean’s Eleven” trilogy, he’s a master at handling large ensembles. Many of his other brightest qualities shine throughout the film: his thoughtful, unobtrusive style of editing, always getting us where we need to go without drawing attention to itself; his expert deployment of music, placing unusual score in moments where we don’t necessarily expect it to be there, and ramping up the tension as a result; and, of course, his wonderful visuals. I’ve always loved the look of Soderbergh’s work, but this is one of his more impressive and unconventional looking films. The framing is what strikes me: this may sound odd, but many shots look as though they were composed for IMAX. As a point of reference, the only fiction film ever really photographed for IMAX is Nolan’s “The Dark Knight,” but it illustrated how different large-format framing is from traditional photography. With an extreme, heightened resolution and some extra space, one can place the subject of the frame further back than what we are used to, and then fill the extra area with additional detail, all thanks to the amount of clarity inherent in the premium stock. It’s a really exciting, new look for films, and Soderbergh emulates large-format framing with “Contagion.” It wasn’t shot in IMAX, but it was filmed in what may be, at this point, the next best thing – the Red Epic “Tattoo” camera, which boasts a groundbreaking 5K resolution; couple that with a 1.85:1 aspect ratio - which favors height over width – and you get a film full of bold, invigorating photography that would be right at home on an IMAX screen. Although I didn’t see it in the format, Warner has released it this way, and if you feel like splurging the extra money, that would be a wonderful way to watch the movie. 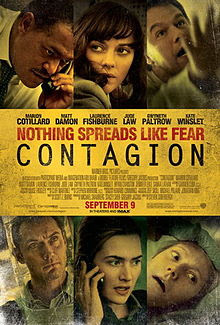 If not, find the biggest screen you can, because “Contagion” is an essential theatrical experience. But as visually fascinating as I found the film, when all is said and done, it’s the narrative structure that really makes “Contagion” a must-see. The overwhelming, terrifying sense of realism the film creates must be experienced to be believed, and that realism is a virtue of the film’s structure. “Contagion” certainly doesn’t break new ground in the way it tells its story, but it is a particularly well-constructed, confident, and expert realization of this structure, and as such, it’s one of the better films I’ve seen this year.